how do I know WHEN to repot my ponytail palm’? 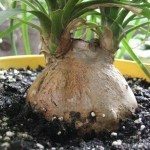 My ponytail palm has quite a bit of root showing on the surface of soil. I'm hoping that this means to repot it. Thank you in advance!